Most of the time I'd say my "diet" consists of 75% healthy stuff, and 25% cookies, brownies, gummy candies and the occasional soda pop and Chinese takeout. Remember, it's all about moderation. But my must have buys whenever I go food shopping always include avocados, tomatoes, black beans and chickpeas, some kind of salsa, plain Greek yogurt and fruit. With avocados you have to act fast or else you'll end up with a mushy, not-so-green colored fruit. I had two left sitting on the kitchen counter and randomly thought about making some kind of dip. Don't want to waste avocados! This dip is creamy, cool, and healthy! It's so simple to put together and you'll be glad you did! I wouldn't call this a guacamole per say as it's missing some key ingredients that guacamole typically has. This dip is slightly different, and I like that. You can see my Trader Joe's Copycat Guacamole that I made last year here. That stuff is crack! 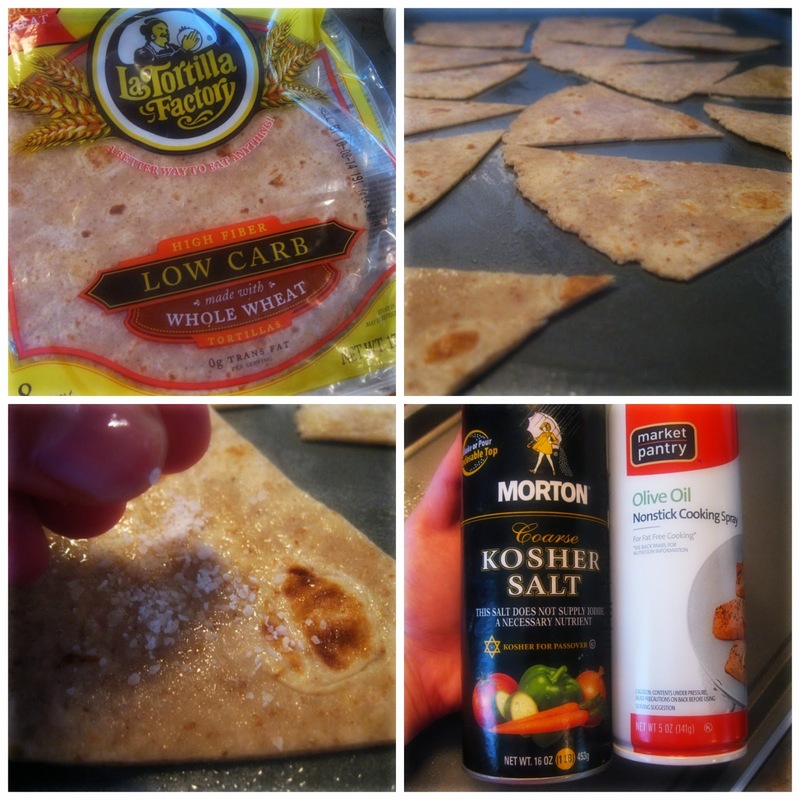 And with homemade whole wheat tortilla chips? This is an all around healthy snack that's quite addicting. Give me a big ol' bowl of guacamole and chips for dinner and I'd have nothing but a smile on my face! -Stir the avocados and yogurt together until well combined. Add the beans, tomatoes, salt and pepper and mix well. Keep adding salt and pepper until the taste is to your liking. Transfer to the fridge, covered with plastic wrap to chill for a few minutes. Enjoy with tortilla chips, on a wrap, or on top of chili. Use a cookie sheet and spray with cooking spray. Use kitchen scissors or a large, sharp knife and cut wedges out of the wrap. They don't have to be perfect. Just tortilla chip-like and very dippable. That's a word if you ask me. Spray each wedge lightly with cooking spray and sprinkle with salt. *Pre-heat oven to 425 and bake for 3-5 minutes. These brown and crisp up quickly. Enjoy your healthy snack...or meal. This stuff is addicting! What are some items you must always pick up at the food store? Okay, this looks DELISH!!! I'm alllll about avos and black beans. I totally need to make this stat! OMG so awesome. I have to try it cause I like all the ingredients. Great blend. Yum. Sorry I meant to put mom.